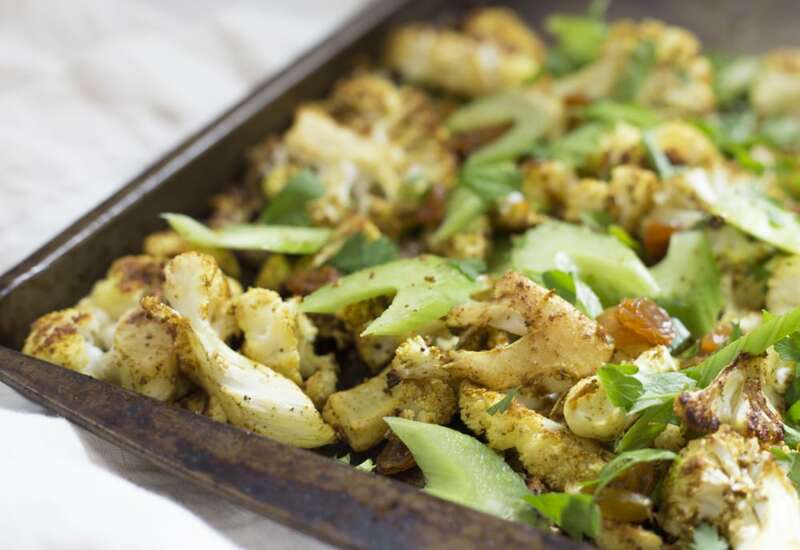 To bring out cauliflower's best flavor, I like to roast it until it's really caramelized and tender. Thanks to its naturally mild taste, it takes so well to whatever flavor profile you introduce. In this recipe, the heat from the curry powder and cayenne is balanced by the sweetness of golden raisins. Cool, crunchy chopped celery and fresh parsley adds a refreshing flavor and texture contrast. The cauliflower is delicious served as a healthy, dairy-free side dish with roast chicken or fish, perfect for cozy winter meals or casual dinner parties. Try making curried cauliflower rice. Pulse the cauliflower florets in your food processor, then sauté the "rice" over medium-high heat with the oil, curry powder, salt and cayenne. You won't get the same caramelized flavor, but it's a great grain substitute. Per Serving: 130 calories; 8g fat; 13.9g carbohydrates; 4g protein; 0mg cholesterol; 175mg sodium. I felt like I was finally out of ideas to make roasted cauliflower interested and found this recipe. I love the standout flavor of the curry paired with the sweetness of the raisins. This was such a nice side dish to have for our gluten-free fam! This was really simple and easy to make. The curry and cayenne seasonings gave the cauliflower really delicious flavor. Next time I will try this recipe, only with cauliflower rice, I cannot wait!